This blog, like most, is linear. It’s in chronological order, so things once thought precious get buried and lost at the bottom of the metaphorical sock drawer until you’re rummaging around in there one day and happen upon that thing you had almost forgotten about. This is my effort to dig up the things buried deep in this blog, with the most-read marketing posts of 2014. I hope you value one or two of the unearthed posts as a discovery that’s useful—like, say, a Kennedy silver dollar your uncle gave you. But not, say, a pouch of your firstborn’s baby teeth, which seemed cute and precious at the time. But when you find them years later, they’re actually kind of gross. First, a side note: I had it in mind that a “best of” this blog would highlight the most popular posts of the year. And drilling down more: If something is popular, can it also be good? Hemingway would say no, categorically. “If you become popular it is always because of the worst aspects of your work,” he famously said. But we’re marketers. Not novelists. Data is everything, right? Yes and no. Though metrics can tell you what resonates with your audience, it’s also worth noting, on this first day of 2015, that performance is a rear-view-mirror metric, expressing what was popular, not necessarily will be popular. For marketers and content creators, rear-view-mirror metrics are only part of the story. The other part is the sensibility, creativity, inspiration, and artfulness you bring to the work you do. Published in late 2013, this piece was the scaffolding for what would become the best-selling Everybody Writes, published almost exactly a year later. Because not all strong woman leaders are bossy, and not all bossy women (or men!) are leaders. When working from home has a dark side. I’m allergic to complexity. So when I tried to find a simple org chart to help organizations visualize their own content team, I couldn’t find anything quite simple enough. The mess. The tears. The exultation. It’s all here. We are all capable of shedding mediocre writing. Dear Daniel: Thanks for your kind and thoughtful feedback? Bye. 7. How Do You Balance Your Personal and Professional Social Media Presence? Here’s my approach between @marketingprofs and @annhandley. What’s yours? A first look at the newborn, mewling EW (d’aw!)... and free giveaways for the book launch. What if you have only minutes per day to focus on your marketing? I couldn’t love more what the New York Public Library does on Instagram. Here’s one example. What you can learn from Ben & Jerry’s hilarious tweet a year ago. I loved Tiny House! I believe you started the East Coast movement (at least, I think you should take credit for it). My fave is #8: Introducing Everybody Writes. I remember the excitement from everyone’s comments. Didn’t it feel great to see how many people care about your work? We couldn’t wait to support you and help in any small way to promote the Amazing Ann Handley! As far as “Dear Daniel” is concerned, I betcha $20 bucks that’s the alias name for you-know-who (and I say that with a cheshire cat’s grin as a representative of loyal Ann Handley Fans who took immense pleasure in trashing “his original work” on Amazon). Thanks for your kind words. And happy new year to you and yours! Do you have a fridge in your tiny house office that has Ben & Jerry’s pints in it? Do you lean in to take shelfies in front of your book case? When you balance your personal and social media presence, do those Ben & Jerry’s pints help? And thank you for differentiating between “bossy” and “leadership” and so articulately highlighting that subtlety. Hi Ann, I want you to know how much I’m enjoying your book Everybody Writes. It’s full of gems. For instance, I couldn’t agree more with you that it pays to “show up and throw up” blog posts in advance of rewrites and further edits. I find I produce better blog posts when I resist the temptation to filter ideas when first submitting them to paper and leave the spit ‘n polish editing until later. And there’s another upside; the work gets done a great deal quicker too. I’m looking forward to devouring the rest of your book shortly. 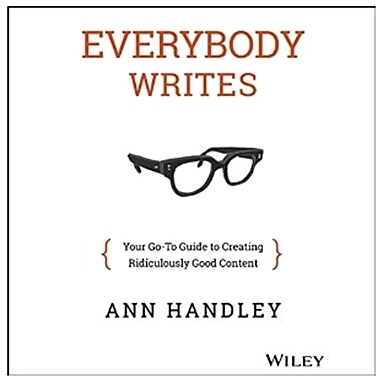 Loved “Everybody Writes”. I definitely keep it at my desk for good reference and inspiration.